What Juice Raises Your pH? A healthy pH level in the human body is slightly alkaline, between 7.0 and 8.0, just over the midpoint on a pH scale. The ideal pH for blood is 7.4, according to chemists at Washington University in St. Louis. Conditions associated with acidic imbalance in the body are diabetes, osteoporosis, kidney disease, heart disease, depressed immune functions, weight problems, depression and fatigue. Diet determines pH balance, and vegetables and fruits are alkaline-forming foods. Juicing with vegetables and fruits can be an effective way to raise pH levels. Most Americans should double the amount of vegetables and fruits they consume each day, according to the 2010 Dietary Guidelines for Americans. The government's goal of having you fill half of your plate with vegetables at every meal can be hard to manage for some people. Adding extra fruit to meals or snacking on fruits doesn't always work out. But the University of Maryland Medical Center says that pH levels in urine -- one easy way to measure pH -- can be raised by increasing citrus fruits and vegetables in your diet. So drinking fresh and fortified juices can bridge the gap to adequate and balanced nutrition. Most fruit is alkaline-forming and will raise the body's pH levels. Even citrus fruits become alkaline during the digestive process. Good choices for fruits to juice for a more alkaline system are apples, ripe bananas, grapes, peaches, nectarines, pears, mangos, oranges, grapefruit, pineapples, pomegranate and berries of all kinds. Several fruits are slightly acidic, including cranberries, prunes and plums, and should be consumed in moderation if your goal is to raise pH levels. Green smoothies can provide the best of both fruits and vegetables in a drink that is filling enough to serve as a meal replacement. 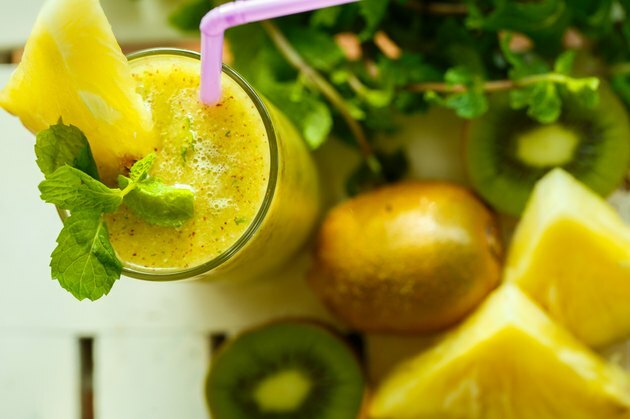 Blends of kale, spinach and sprouts with melon, kiwi, orange juice or strawberries are loaded with vitamins and antioxidants and are alkaline. Apple juice, celery, spinach and grapes are equally well-balanced. Ripe banana thickens blended juice to shake consistency and adds sweetness to a smoothie. Alkaline vegetables you can toss into a juicer or blender include celery, broccoli, leaf lettuces and greens of all kinds. Carrot juice is alkaline-forming and combines well with other alkaline fruits and vegetables for a sweet, nutritious drink. Try carrot and celery or carrot and apple juice for something simple to raise pH. Tomatoes are tasty when juiced with herbs, garlic, celery, cabbage, parsley and other veggies. The highest nutrition comes from juice you make and drink fresh, but you can use a commercial low-sodium, organic vegetable juice as an occasional alternative.